tatted snowflakes. my grandma taught me to tat ages ago, but i haven’t really done much with it since. 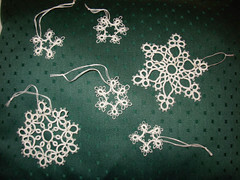 but i wanted snowflakes for christmas decorations, and while looking for patterns (initially i was thinking crochet), i found a simple tatted snowflake pattern. which led me to search for other patterns. the small snowflakes come from an old mc’call’s needlework magazine my mom has and the larger snowflakes are from tatting patterns and designs, which i borrowed from my grandma. the round one in the lower left actually has an opps! – apparently i can’t count and did 9 repeats instead of 8.
i haven’t completely neglected my knitting, though. 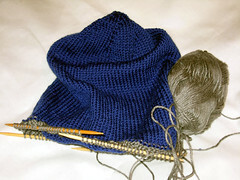 my dad’s hat is just past the half-way point and i hope to finish this week. however, i have a major distraction. from blue moon fiber arts, laci in the korppi colorway, arrived on saturday. 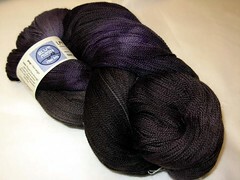 it’s a 100% merino laceweight and wonderfully soft. almost so soft i didn’t want to wind it up. however, irtfa’a was calling. 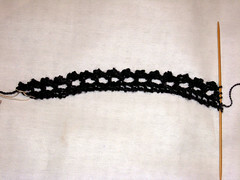 i’ve only just started on the edging, and i can’t wait to do more. i’ve loved all of anne’s patterns that i’ve attempted thus far, and this one is so gorgeous (although, i have to admit, the pretty yarn did it’s fair share of selling the pattern!) that i had to start it right away. other knitting? what other knitting?! Awww – these tatted snowflakes are ever so beautiful! They look so fragile and delicious! You know, I’ve always wanted to learn tatting but never got around to it – seeing your beautiful work sure inspired me to give it a try soon too, perhaps also for some Christmas decorations? Thank you for inspiring me – I love your work! oh those tatted snowflakes are adorable, they look amazing. I’ve also always wanted to learn tatting. And that shawl? Simply beautiful, I’m looking forward to seeing the progress on that.